Today you can enjoy a superb tour of the Iveragh Peninsula, which will give you the opportunity to discover the Ring of Kerry. Taking in spectacular scenery such as mountains, peat, bogs, lakes and magnificent views of the Atlantic Ocean. Leaving Killarney pass through Killorglin, famous for its Puck Fair, then to Glenbeigh where the cliff road affords panoramic views of the Dingle Peninsula & Dingle Bay. Passing through the peat bogs one arrives at the sea town of Waterville. Continue to Sneem Village, famous for its brightly coloured houses. Travel northwards to Tarbert & take a short boat ride across the mouth of the river Shannon to land on Clare’s shore at Killimer. 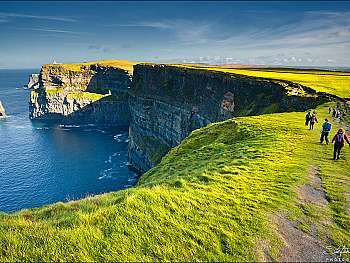 Travel along the coast to the Cliffs of Moher, the most majestic cliffs in Ireland which rise from the Atlantic Ocean & extend for over 7km. On a clear day, you can admire the Aran Islands & Connemara Mountains. 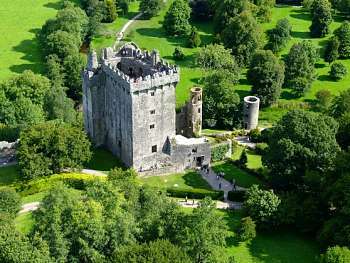 Enjoy a tour of the Burren Region. The Burren is a strange & unique region in Europe; it is a high plateau of porous limestone situated in Northern Clare. The limestone is bare with no trees growing here or land covering the stone. But the Burren is not as deserted as we believe: the cracks allow different types of flowers to grow all year round. The rocks hide many caves like Ailwee. After a final Irish breakfast transfer to Shannon for your flight home – transfer under own arrangements. OR Travel to Dublin via Galway City, with its narrow streets, old stone and wooden shop fronts, good restaurants and busy pubs. The city has attracted a bohemian crowd of musicians and artists, which add so much to the character of the city. Enjoy some free time in the city for some personal sightseeing or shopping. Continue to Dublin, arriving at approx. 16.00 – transfer to Dublin Airport for departure flight home. Alternatively we can book hotel accommodation for you in Dublin.